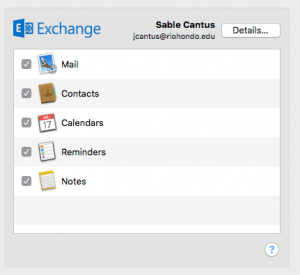 Your Rio Hondo email uses Office 365 for Education and is able to be synchronized with your Mac OS X computer. 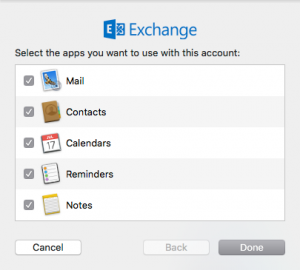 You will be able to use the built-in Mail, Calendar, and Contacts applications. 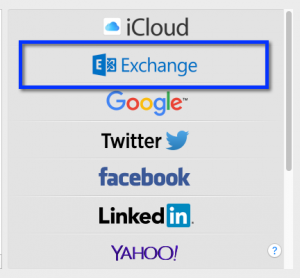 Please follow the steps below to configure your Rio Hondo exchange account on your Macintosh computer. Click on the images to enlarge them. Please ensure that your device is connected to the internet prior to following these steps. Click on the Apple icon in the upper left hand corner of your screen and select System Preferences. Enter your name as you would like to appear on your out-going email. Enter your full email address for Rio Hondo in the Email field and include the @riohondo.edu. 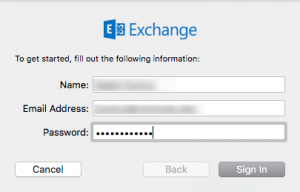 Enter your network password in the password field. Once the credentials are confirmed you will see the Account Summary confirmation box displaying your name, email, and the server address. If you do not see the Account Summary screen please check that your email address and password are correctly entered. Confirm the services that you would like to synchronize with your Mac.